I wake feeling as if I had slept in. Check my watch hanging back near the mizzen mast, it is just 6 a.m. I remembered waking in the night to a sky full of stars, then waking again to clouds, wind and chop. The clouds still hang low this morning, a hint of light on the eastern horizon. I sail off anchor under mizzen and jib. The wind is out of the E at 15 with gusts over 20 according to the report from the nearby Bishops Head weather station. My course is due west across the Honga River to the Thorofare between Middle and Lower Hooper Islands. Leaving Crab Point Cove I sail comfortably with following waves. I find myself wondering if the low, dark clouds make the wind seem stronger. The entrance to the Thorofare is hard to find. The channel runs north-south and as I approach from the east it is hidden by the marshy point on the south side. What I take to be two local navigation markers slightly to the north turn out to be duck blinds. I am heading for them as my gps finally tells me that entrance is to the left. I am almost in the channel before I recognize it. 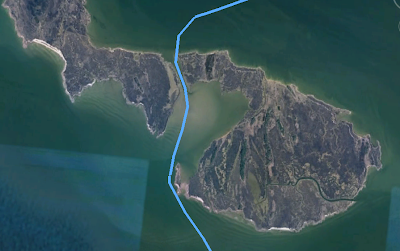 It is a beautiful passage, first through a narrow channel and then over wide sand flats. That water is light green and very clear, the wind perfect to carry us under the two small sails between the islands. A green plastic chair sits on an islet looking towards the bay. I envy whoever gets a chance to use the chair and enjoy the view. My centerboard touches the bottom and I raise it, then it touches again and I raise it more. The rudder starts to drag in the sand so I swing that up. But I don't need the board or the rudder to tell me how shallow it is, I can look over the side and see. The water gets shallower, the board is now up all the way, the rudder down just low enough to Spartina direction. I can feel the hull sliding over the sand and wonder if I will have to get out and walk the boat across the flats. Then the sand falls away and we sail out through the mouth into Chesapeake Bay. 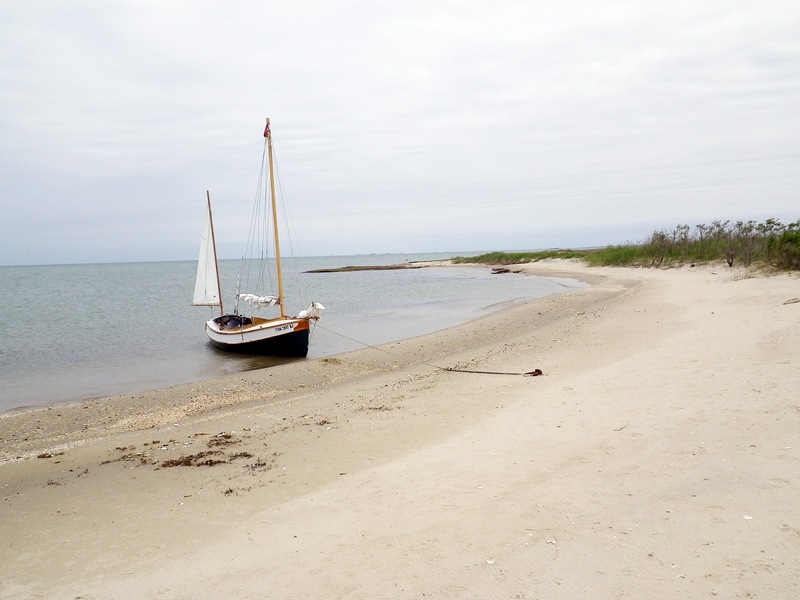 I round up and drop the anchor on the edge of a sandy beach to reset the cb and the rudder. I also tie a reef into the main. 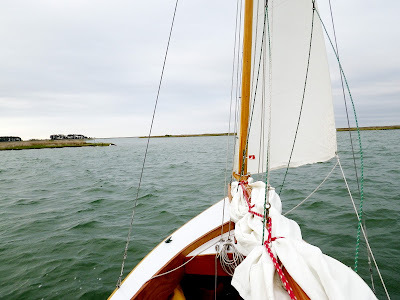 Delighted with having sailed through the Thorofare, something I have wanted to do for a few years, I raise anchor and sail south in the lee of Lower Hooper Island under mizzen, jib and the single-reefed main. The wind is strong out of the E, the water calm in the lee of the island. As the shore of Lower Hooper Island falls away to the east we get the wind and the waves funneling through Hooper Strait. It is rough, with waves in series of three coming from the SE. The first two waves in each set we handle fine, the timing of the third waves comes with the bow diving into the face of that last wave and a burst of spray flying off the starboard side. Then I wait for the next set of waves. Spartina feels solid heeled under the wind, the waves make the crossing fun and exciting. I think maybe I'm getting to be a better sailor. Then I think maybe I'm just learning to trust John Welsford's design a little more. 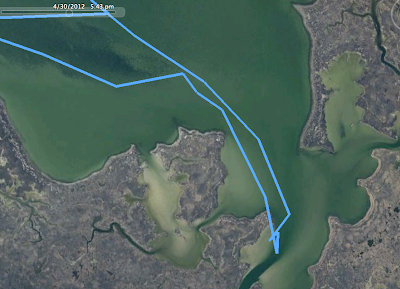 It is about three miles strait until we are in the lee of Okahanikan Point on the NE corner of Bloodworth Island. The waves disappear, the wind holds steady. 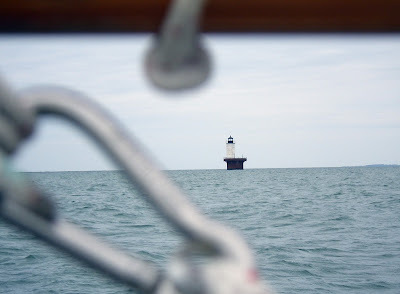 I tack once to get in closer to the island where the water is even calmer, then sail south toward Adams Island. By 10 a.m. I'm in the lee of Adams, with Spring Island visible to the east and Holland Island to the south. I sail in the lee of Holland Island, eventually turning into a small sand cove at the south end. Just over a hundred years ago the island was home to over three hundred people. 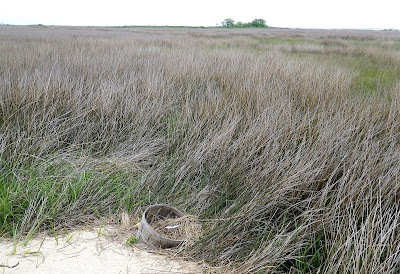 Now it is bits of sand and marsh, with debris for commercial fishing washed up on the shore. There is a cemetery, but I suspect it is to the north through the marsh and do not know how to get there. I content myself by walking along the beach, photographing shells or whatever else I can find. 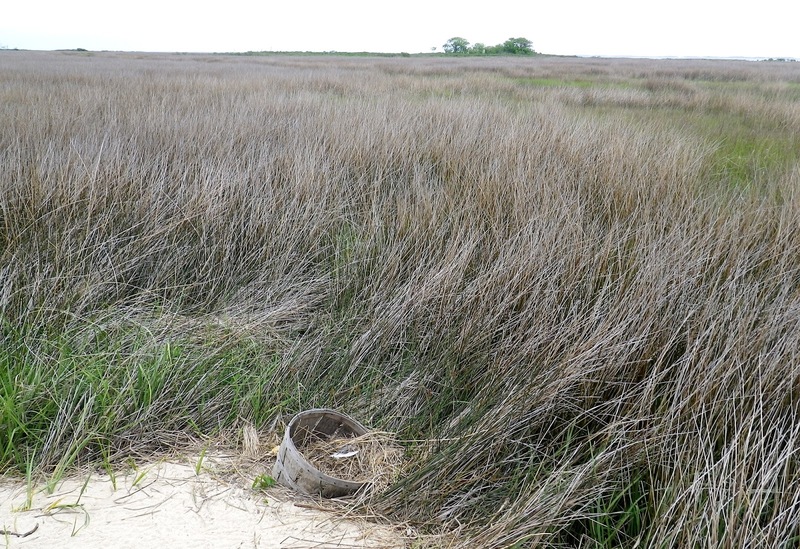 I spent 30, maybe 40 minutes relaxing, then push Spartina off the each to continue south. I tack west into the wind to reach the lee of South Marsh Island. The second tack carries me into Pry Cove on the southwest shore. The cove is wide, shallow and, as I had suspected from looking at the charts, excellent protection for just about any wind. But it is only early afternoon, too early to stop for the day. 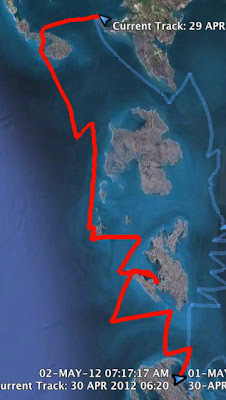 Instead I sail farther and farther into the cove looking for a small opening to Kedges Straits. I round a point and see the opening. I also see from looking at the shoreline that the tide is down almost two feet. 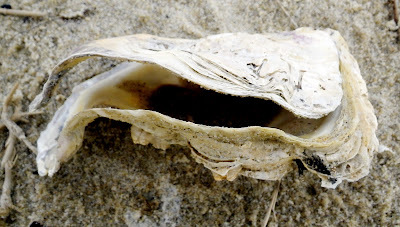 I drop all sails to motor to the cut, soon finding Spartina sitting on the mud. I cut off the outboard, use the oar to push off the mud into deeper water. The channel looks like it might be deeper to the left so I come at it again, this time to the south. I see two sea gulls watching me from near the entrance to the cut, exactly where I had hoped to find a couple of feet of water. They are standing in an inch of water. 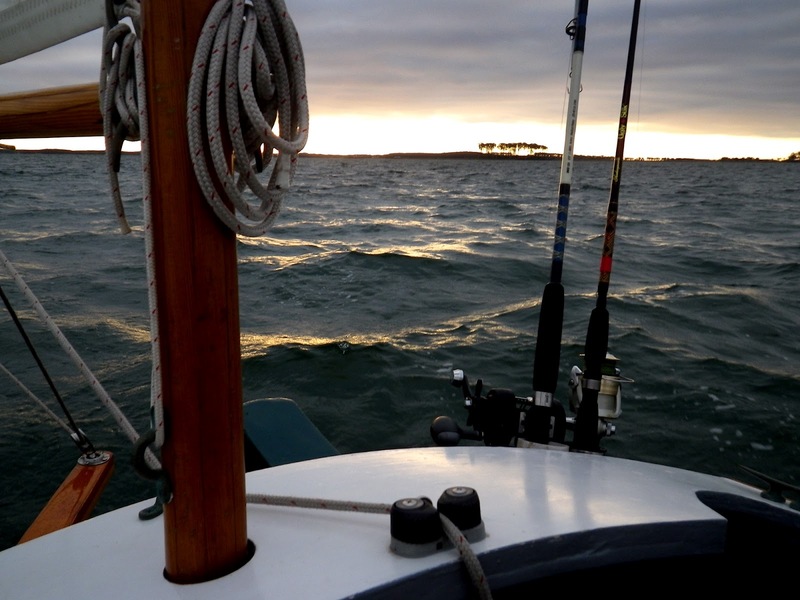 I swing around, motor out into open water and raise the sails. I will save that channel for another day when the tides are higher. I leave Pry Cove and turn south across Kedges Straits. The wind is not quite as strong and it has swung to the SE. The strait, being open to the wind and waves, feels similar to the Hooper Strait crossing from a few hours earlier. I shake out the reef in the main and point up a little higher. I pass the Solomons Lump Lighthouse and reach calmer water in the lee of Smith Island. I turn to early into Back Cove and find Spartina crossing a shallow sandbar. I raise the cb and rudder and drift until there are a couple of feet under the boat. 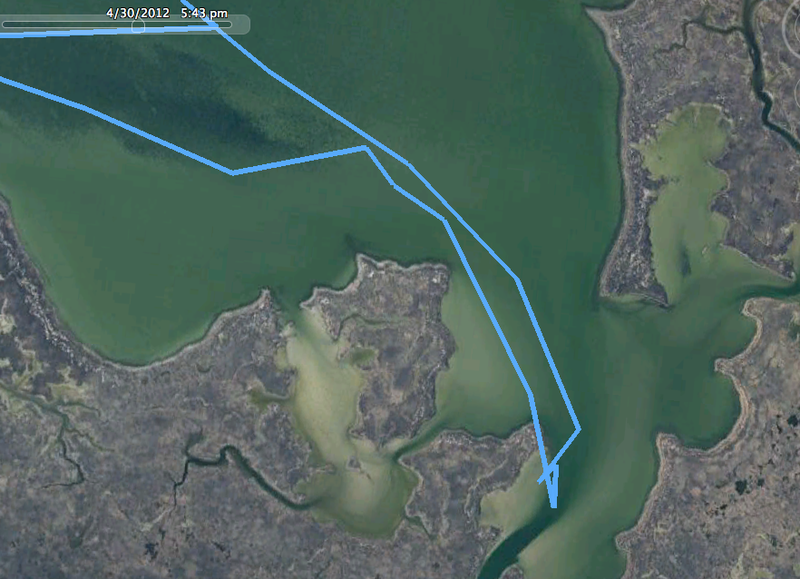 Then I sail into the cove, choosing a protected bay about a mile north of where I had anchored two nights earlier. Anchor down at 4 pm. Very nice little breeze and she is going along wonderfully. Seeing this makes me want to get on the water sailing right now. That's interesting - I was watching your Spot page and noticed your little foray down into that channel and then the abrupt turn-around and head back up and around the long way. I was wondering why you did that. Of course the view on-line doesn't show actual current conditions, so it looks like there's a channel there. there is a channel there, but not at low tide. If the water had been up a foot or so, not even to the high tide mark, I think I could have made it. But at low tide I did not want to get stuck in the much. You have a gorgeous boat and an amazing sailing area; really enjoyed reading about your adventures. You made mention of how you're learning to trust John Welsford's design more, which struck a chord for me, as I'm finding the same with our Drascombe Lugger. 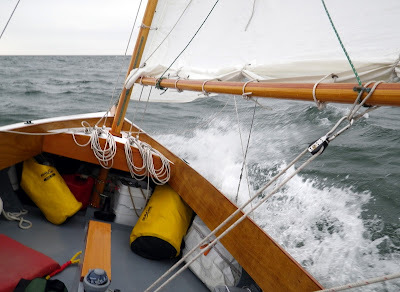 Into our second year with her now, and the more I learn to trust John Watkinson's design, and the more she proves it to me, the better a sailor the boat makes me I think. I think you are exactly right. Learn how the boat handles the water, learn to trust the boat. I'm a big fan of drascombes. Very nice boats.